For the past few years, juice diets like the Master Cleanse have been all the rage, but they often make you feel so lightheaded, dizzy and famished that you want to give up after the first day. With that in mind, Ayurvedic practitioner and massage therapist, Megan Darwin, has developed her own program called the Juicy Yogi Detox that incorporates traditional principles with modern juicing to give Angelenos the ultimate cleansing experience. 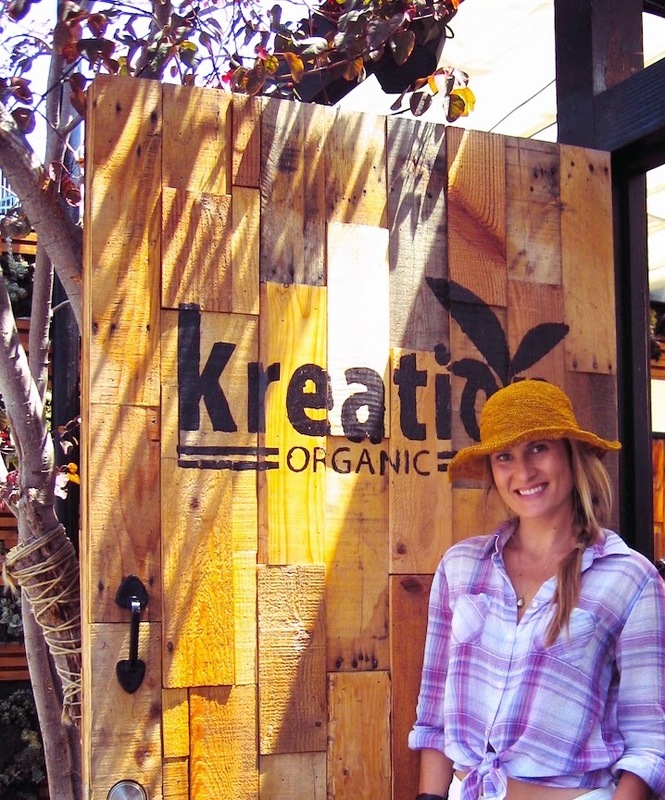 I met up with the L.A. native to talk about growing up in Arcadia, her discovery and training in Ayurveda and the Juicy Yogi Detox at Kreation Kafe/Juicery in Venice Beach. This is where she regularly stops for a bottle of juice on her way to treating clients at Spa Sophia, which is also located on Abbot Kinney Boulevard. As we take a seat in Kreation’s busy yet comfortable patio, surrounded by wood paneling and live succulents covering sections of the wall, the long list of juice options can be a bit intimidating. They offer several cold pressed juices, like the Green (apple, cucumber, romaine, kale and pear), Trinity Twist (lemon, apple, carrot and beet) and Rosy Aura (rose water and cantaloupe). Megan shares that her favorite of their Premium Detox blends is the Synchronize with dandelion, kale, cilantro, pear, pineapple, jalapeño, fennel, basil, turmeric, mint, cucumber, parsley, celery, spinach, romaine, lemon and Himalayan salt. She is also a fan of the refreshing Limonana (alkaline water, lemon, mint and raw cane sugar) lemonade. This Abbott Kinney Kreation location also serves a full menu that includes kabobs and wraps, as well as cold and hot tapas. After ordering a Quinoa Chopped Salad and some Synchronize juice, Megan explains that the imbalance people experienced while doing a strictly juice cleanse is one of the factors that inspired her to design the Juicy Yogi Detox, which is also based on techniques she acquired in her five years of studying Ayurveda’s traditional cleansing process of Pancha Karma. While her life currently revolves around total health and wellness, Megan didn’t always maintain the healthiest of eating habits as a child in the suburb of Arcadia, Calif.
Megan began researching different paradigms of natural healing but was a bit overwhelmed by all of the different philosophies: Chinese healing, homeopathy, naturopathy, etc. That is, until she was introduced to Ayurveda. While taking a Pancha Karma training workshop, Megan’s abilities caught the attention of the college’s founder, and she was offered an apprenticeship at a private Ayurvedic retreat center. Megan thoroughly enjoyed her time at the center and even returns there each fall to lead people through detoxification, but she always knew she would return to Los Angeles to open her own practice. Aside from Kreation, you can often find her grabbing a bite at Golden Mean or taking in a concert at the Santa Monica Pier during the summer since she is an avid music lover. In addition to the Juicy Yogi Detox Program, Megan also offers any of her Ayurvedic therapies (herbal massage or steam, Nasya sinus therapy and Shirodhara) as separate or coupled services. Just hearing her describe the relaxing therapy has me ready to make an appointment ASAP. Megan is also planning to host discussions to educate Angelenos about the different ailments that Ayurveda can treat, from cancer and insomnia to sinus and allergy problems, so make sure to check in at her website for updates. For more information, call (310) 780-5006 or visit integrative-ayurveda.com. I love to detox and I love tea but never thought of doing the two together! Interesting! Thanks for sharing about massage therapist Megan Darwin. When I read this article I am very excited to know about megan darwin. I also love detox and take care of my always maintain health. I am really excited to follow this article thanks again!